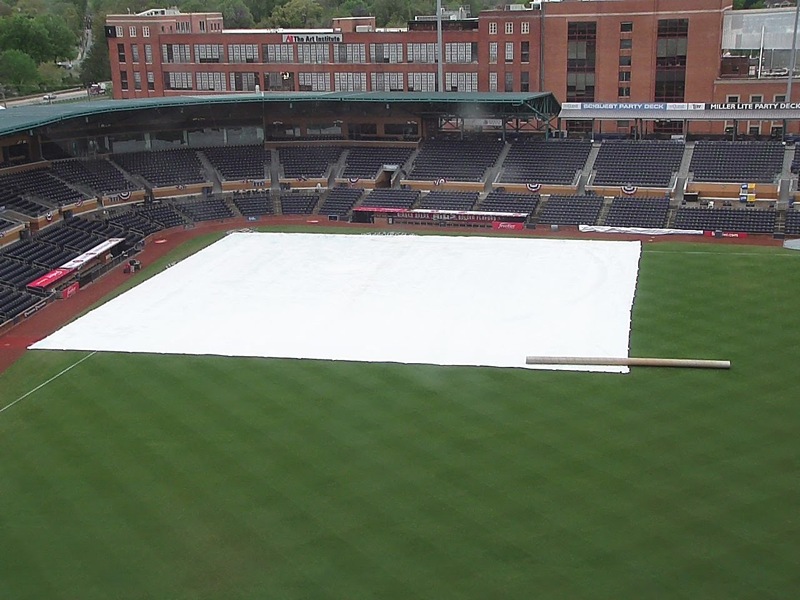 My condolences to: the players, the staff, the ground crew, and to us fans. By far the most miserable home opener in memory. I have to be honest: I was watching the webcam from home and when they had not pulled the tarp by 8:00 I decided not to go to the game. First look (via MiLB TV) at 30 year-old Alexi Everett Teaford. He grew up in the KC Royals system, had a decent 2011 with the Royals, so-so 2012, and spent most of 2013 pitching in Korea. [stats] He looks to be a product of the Rays search for value. Last night he had trouble right from the start and never quite recovered. Meanwhile, the Tides’ Mike Wright pretty much handcuffed Bulls’ hitting. Bulls reliever José Dominguez, whom we’ve never seen, got called up to the Rays and put in a very clean 1⅓ scoreless innings for them last night. Veteran Ronald Belisario has been added to the Bulls roster. Thirty-two year-old Belisario was signed to a minor league contract by the Rays and was thought to be in serious contention for a bullpen job until he discovered he’d fractured his off-shoulder in a swimming pool incident earlier this winter. He had a good ⅔ of an inning for the Bulls last night. Meanwhile, Mikie Mahtook got his first big league hit and it was a big one a home run. Video here. Story here. Lastly, WDBB favorite Kirby Yates is coming back for what could be a very short stay. The way it seems to work is that when a major leaguer gets sent “down” he can take a couple of days to get here. A player going “up” catches the next plane. In Yates’ case he simply was the odd man out as the Rays are attempting to manage a very complicated starter/reliever situation. There’s a chance that he may never pitch an inning for the Bulls. It is Everett Teaford, not Alexi. Right? Oh man. How did I manage that? Fixed.